August has been a busy month so far with our Secondary School Teams competition and heading towards the end of the month we are focused on preparations for National Secondary School Champs. Veteran Fencers make sure you scroll to the bottom to find a deal on entry to Commonwealth Veteran Champs. For all Kiwi fencers there is an EARLY BIRD DEAL that is running out on 31 August! Pay on or before 31 Aug and your FIE licence (usually $70) is included in the entry fee; as of 1 Sept it goes on top! Go to http://www.cvfc2016.co.nz/ and enter! July has been a quiet month for us but August and September promise to be busy! Firstly - good luck to everyone headed off to President's Cup in Christchurch this weekend! President's Cup is the second of four national open events in the fencing calendar. In local affairs our Secondary School Teams event is about to kick off. This runs over the first three weekends in August (6th, 13th, 20th) with Foil split across the first and third weekends and Epee + Sabre in the middle weekend. If your school doesn't have a fencing team you can enter to be part of a composite team. Check out the event page for details: https://www.fencingnorth.com/events-rankings/competitions/394/fencing-north-secondary-school-circuit-2016-teams. Entries close on the 1st August but we will accept late entries through till the 3rd August. We'd also like to congratulate the fencers who competed recently at the Australian U15 & U17 Fencing Championships! Lots of good results all around. Special mention to Lena Jacob on placing 3rd in the U15 Girls Foil! Also well done to those who placed in the team matches! (Nicholas Miehlbradt 3rd= U17 Boys Epee Teams, Oliver Zou & Alex McGuire-Barnes 3rd= U15 Boys Foil Teams, Lena Jacob & Chantelle May & Hannah Irwin 3rd= U15 Girls Foil Teams). A results correction to make - at the conclusion of the Individual Finals of the Secondary School Circuit we announced that Auckland Grammar School were the Top Boys School for 2016 edging out Kristin by one point. After recalculating this we found that we made a mistake and actually Kristin beat Auckland Grammar School by one point - it doesn't get much closer than this! Congratulations to Kristin School on being the Top Boys School in the Individual Circuit. Kiwi Fencers! The EARLY BIRD deal is running out on 31 August! Enter and pay on or before 31 Aug and your FIE licence (usually $70) is included in the entry fee; as of 1 Sept it goes on top! Competition T-Shirts - National Secondary School Championships! Hey all! 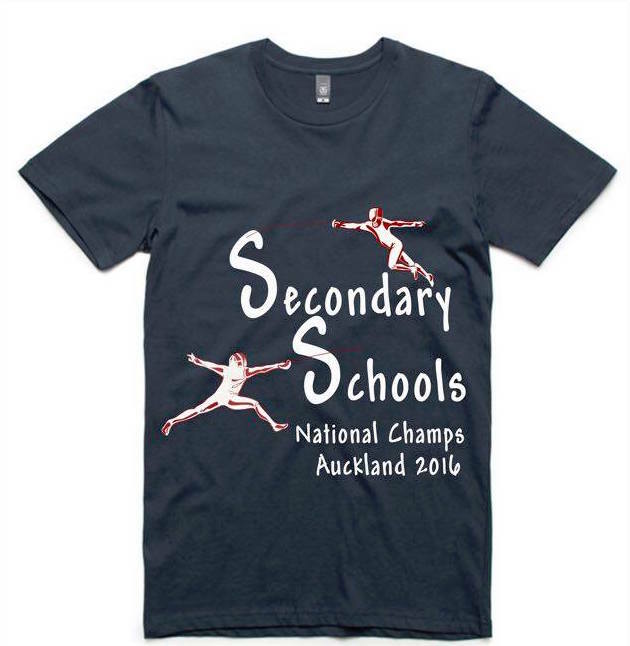 By popular demand we have created a unique t-shirt for National Secondary School Championships. This is a limited run and will sell out. Pre-order pricing is available if you order using the form below before the 1st September. $30 per t-shirt pre-order or $35 on the day if any are left! Limited stock in each sizing (S/M/L). T-Shirts are 100% cotton. Pre-orders to be picked up from and paid for at the event.